Haven't I read this one before? Cat DeLuca is the owner of the Pants on Fire Detective Agency in Chicago. She's ably assisted by her partner, beagle Inga. 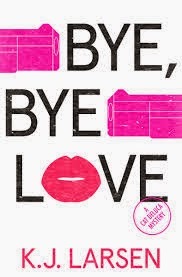 Bye, Bye Love is the third installment in the series by K.J. Larsen. While out on a walk together, Inga leads Cat to a body. The man has been shot in the face -- in fact, his face is missing. Cat goes through the dead man's pockets to look for identification, and comes across an envelope full of cash with her Uncle Joe's name written on it. A park employee comes by, and when Cat tells him she's going to call the police to report the body, he says he's already done it. He then proceeds to knock her out with a stun gun. When she comes to, she's still in the park, but the dead guy is missing. She calls her brother, Rocco, a cop, and reports her find. Of course, when the police arrive and find there's no body, they are reluctant to believe her story. Luckily, there are some blood traces left behind, so Captain Bob of the police has to admit that Cat discovered something in the park, although he's not exactly sure he buys her story. Most of the men in Cat's family are either current or former members of the police force, including Rocco, her father and her Uncle Joey. Her boyfriend, Chance Savino, is an FBI agent who is often away on mysterious missions. Cat must try to find out what connection her Ferrari-driving Uncle Joey had to the dead man as well as keep herself safe when the "park employee" seems to be coming after her. If I hadn't read anything by Janet Evanovich, I probably would have enjoyed this book more. As it was, I felt it was trying too hard to follow the same formula. Feisty, independent young woman? Check. Wacky co-worker? Check. Mysterious boyfriend? Check. Putting herself in dangerous situations continuously? Check. It just seemed to be trying too hard to jump on the Stephanie Plum bandwagon. Also, this book was the third in a series, so I might have enjoyed it more if I started from the beginning. I had a hard time keeping up with all her relatives, their fellow cops, and other characters, so that didn't help, either. There were just way too many people to keep up with.